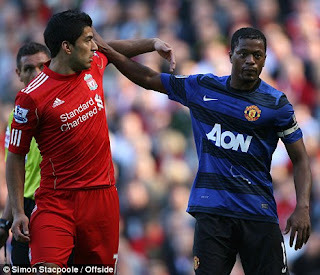 As Patrice Evra waved an imaginary yellow card at referee Andre Marriner, the Anfield crowd made their immediate displeasure known. Boos rang out at the French fullback which continued for the rest of the game. Even avuncular old Uncle Ray Wilkins was disgusted – or as disgusted as he’s ever likely to be. When Wilkins expresses the opinion that the ref should be allowed to ‘do his job’ it’s as unhappy and critical as the man is ever likely to be. But why is calling for another player to be booked such a big issue? The incident in question saw Liverpool winger Stewart Downing take a blatant and appalling dive. If that act of simulation had successfully hoodwinked the match officials Evra himself would almost certainly have found himself in the referee’s notebook. Is it fair that Downing should commit an offence - which would have seen the fullback walking a disciplinary tightrope for the rest of the game - go unpunished? Surely not. He attempted to get his opponent into trouble in order to gain an advantage – why shouldn’t Evra retaliate in the same way? Evra was not the cheat in this situation – he was the player calling for the appropriate application of the game’s laws and a suitable punishment for the player who broke them. Ray Wilkins’ opinion that the referee should be left to do his job seemingly only applies in certain situations. When a match official gets a penalty decision wrong, for instance, players expressing their anger are occasionally criticised for the way they broach the subject with the referee but rarely for being angry about the erroneous spot-kick decision. Why? Because it’s a game-changing decision? Because it happens to be in the eighteen yard box? Either way it’s still a challenge to the official’s control of the game and ought to be no different to the brandishing of an invisible yellow card. Perhaps it’s because the ‘invisible booking’ is a trait which appears to have been imported from our cheating foreign cousins (much like diving was in the early days of the Premier League). Maybe this kind of cheating is less palatable than some traditional British steel – English football’s constant defence of robust (and potentially leg-shattering) challenges that ‘he got the ball’ is an utterly redundant one if the player was cleaned by a tackler ‘out of control’, but it’s one which is constantly heard from fans, players and managers alike. And it's a defence which misunderstands the rules and laws of the game. Even Uncle Ray (a cultured player who plied his trade in Italy) seems to believe that bending and breaking the rules is more acceptable when done with some bruising muscularity. His defence of a Jamie Carragher tackle on Ryan Giggs, “Wily little bodycheck there from Jamie Carragher. Good defending”, is a perfect example. According to Wilkins' contradictory stance, the manlier form of cheating is perfectly acceptable. It’s not. And appealing for a player to be punished for his misdemeanours ought to be entirely justified, regardless of how he’s contravened the rules or where on the pitch the offence took place. I agree, Mr Ward, with both your initial and wider points. Unfortunately I missed the Evra card waving incident, but if as you say it was because of a blatant dive then Evra is well within his rights to ask the ref to book him, even though I don't usually like or approve of the card waving act. As you point out (and it won't come to anybodys surprise) football fans, players, managers, commentators - heck, virtually EVERYBODY with a passing interest in the game - are probably the worlds biggest hypocrites, and spouters of shite to boot. As I mentioned, I do not like the act of imaginary card waving, but nor do I like the widespread practice of a defender shouting ‘our ball!’ when it has clearly come off him for a throw in / corner. You either accept that attempting to influence the officials is now part of the game, or you don’t. You can’t cherry pick which aspects are OK to do so, and which are off limits. Football sold its morality off a long time ago – it’s a bit late for opposing players and fans to try and take any moral highground.